Giants Come From Behind in 9th to Win Thriller; Did Doyle Touch Home Plate? (October 26th, 1911) NEW YORK– It looked like this Series was shaping up to have a real Broadway ending. Rube Oldring (left, looking at camera), whose sister died a week ago, was one out away from being Philadelphia’s newest hero. 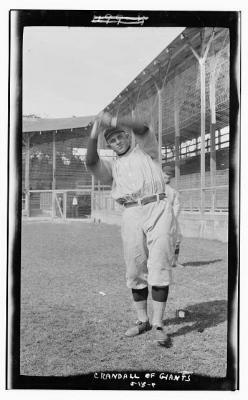 In the 3rd inning of yesterday’s game, he blasted a 3-run shot deep into the left field bleachers off of Giants pitcher Rube Marquard, and the A’s had a 3-0 lead and Jack Coombs on the hill. It looked like the Series was over, and Philadelphia prepared for a celebration. But these Giants proved that their hearts were still beating, and they’ve got as much grit as any team in baseball. They scratched out a run in the 7th, and the 9th inning began with the Athletics up by a score of 3-1. Coombs got Buck Herzog to ground out to short. The Athletics were now 2 outs away from victory. Art Fletcher came to bat with none but the 5,000 A’s fans in attendance cheering. Fletcher brought the other 28,000 kranks back to life with a double. But Chief Meyer grounded out to short. The A’s were now one out away from the championship trophy. Up came Giants pitcher Doc Crandall. Doc, the first pitcher that I’m aware of being used solely as a relief pitcher, had come in in the 8th inning and shut the A’s down. Of course, he’s also known for swinging a fair piece of lumber, and McGraw regularly uses him as a pinch hitter. Jim Nasium over at the Inquirer remarked on the feeling amongst Philadelphia fans as Crandall (pictured below, right) stepped to the plate with 2 outs. Those persons in the audience who are in the habit of grabbing their lunch in the shadow of the Bill Penn statue could already hear the old cheese cloth rustling down the brown October trail, and it just wanted one more man to be retired…we weren’t particular about the form of retirement that might be chosen by the principals in the cast, and then the accumulation of red fire could be touched off and we could spend the balance of the evening laying in an assortment of headaches as a grand wind-up to the national frolic for the season of 1911. Came then the Crandall episode, and the fireworks and the headaches adjourned to meet again tomorrow evening. The “Crandall episode” my colleague refers to was a scorching double to center field (“One of the hardest hits of the Series” said Mathewson afterward) off a visibly tired Coombs. That brought home Fletcher. The score was now 3-2. The A’s were still one out from victory, though it was obvious that Coombs was spent and perhaps even injured. Mack had sent Chief Bender out to the hill in the 8th to try to convince Coombs to come out of the game, but Coombs refused (Mack, or course, is not allowed on the field during a game because he refuses to wear a uniform). After the Crandall hit, Mack sent Ira Thomas out to try to talk Coombs into taking a rest. Josh Devore was coming up to the plate. He had struck out four times against Coombs in Game 2 and had done nothing in this game. Coombs wanted to finish the game and end the Series. Mack left him in and Plank watched from the bullpen. Coombs delivered his first pitch to leadoff man Devore, who cracked a single to left field, and Doc beat Bris Lord’s throw to the plate to tie the game at 3. We were going to extra innings. Mack was determined to allow Coombs to finish what he had started, letting him bat in the top of the 10th. He beat out a bunt to first, but pulled a groin doing so and had to be replaced by Eddie Plank when the two teams went to the bottom the tenth still tied at 3. Plank had been a hero in Game 2, but not on this day. Larry Doyle led off the inning with his 4th hit of the game, a double that landed in the left field corner. Fred Snodgrass bunted Doyle over to third. Plank tried to get the runner at third, but Doyle was too quick, and now there was a runner on third and no outs. The New York bugs were buzzing. Red Murray flied out weakly to short right field, and held Doyle at third. Up stepped Fred Merkle. The goat of that famous game against the Cubs in 1908, he now played the hero, sending a fly ball into right field, deeper than Murray’s. Danny Murphy ran up to make the catch and hurled the ball home. Doyle slid. The throw to catcher Jack Lapp was high. The New York crowd went wild. The A’s shuffled off the field. But wait…there had been no call from the umpire. Home plate ump Bill Klem remarked after the game that Doyle never touched home, and had Lapp tagged him or if the A’s had made an appeal, he would have called him out. Thousands of delirious New York fans began to pour onto the field. 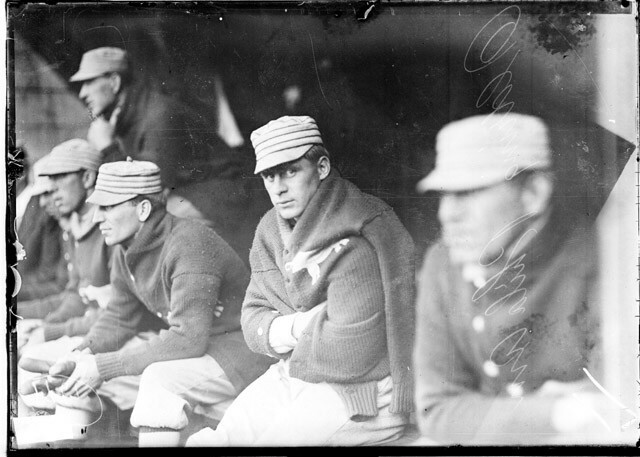 A’s captain Harry Davis looked at McGraw to see if he should protest. McGraw made no move. No protest was made, and Klem walked away. The Giants had completed the come from behind victory, and cut the Series lead to 3-2. Game 6 is scheduled for today in Philadelphia. We’ll have live coverage at 2 p.m. In the meantime, we’ll also have more on this controversial play at home that ended the game.